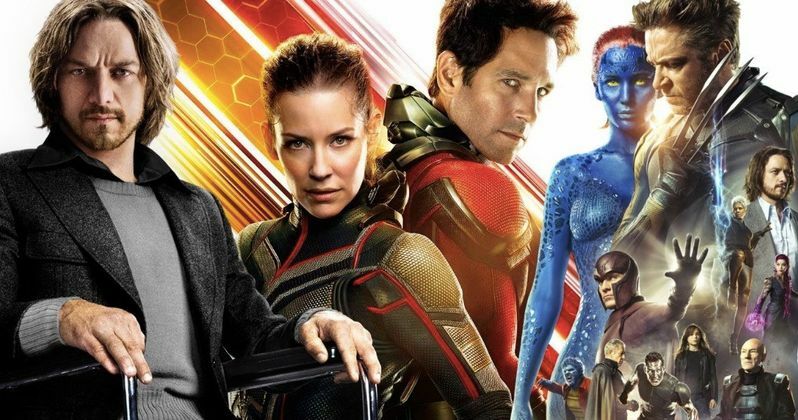 Is it possible that Ant-Man and the Wasp has paved the way for the X-Men to make their way to the Marvel Cinematic Universe? For the most part, Marvel Studios' latest served as an excellent, lighthearted palate cleanser after the events of Avengers: Infinity War. But that doesn't mean some big reveals and possible seeds for what's to come later in the MCU couldn't be planted. While it may seem like a bit of a stretch, it's possible that Marvel has created a way for mutants to exist in this universe. Warning: spoilers ahead for Ant-Man and the Wasp. Proceed at your own risk. One of the main plot elements in the movie has to do with trying to rescue Michelle Pfeiffer's Janet Van Dyne from the Quantum Realm. After a whole lot of heist business, this is eventually accomplished. However, she's been in there for thirty years and, as she says to Michael Douglas' Hank Pym, she's a changed woman. Namely, she's got powers as a result of being in the Quantum Realm. Basically, she can manipulate and transfer quantum energy, sort of like the way that Rogue can absorb another mutant's power and transfer it. Speaking of Rogue, this is a good time to get to the heart of the matter. These powers were explained by Janet as "evolution." And this is where the idea of mutants, and thus the X-Men ultimately making their way to the MCU, may become possible. Evolution has long been a term associated with mutants in the pages of Marvel Comics. Magento often views it as the next step in human evolution. Contractually, since Fox owns the X-Men rights (for now) the MCU hasn't been allowed to use the word mutant. That's why Scarlet Witch and Quicksilver were the products of Hydra experiments and were referred to as miracles, never mutants, in Avengers: Age of Ultron. But the way by which Janet comes about her powers, via shrinking down to microscopic size and changing at a cellular level, is reminiscent of the opening title sequence of the first X-Men movie in 2000, where Charles Xavier provides this brief voiceover. "Mutation. It is the key to our evolution. It has enabled us to evolve from a single-celled organism into the dominant species on the planet. This process is slow, normally taking thousands and thousands of years. But every few hundred millennia, evolution leaps forward." If and when Marvel Studios does fully control the rights to the X-Men franchise, which will happen if the Disney purchase of Fox is fully approved, it won't serve as a continuation of what has come before it. Still, the concept of how mutants come to be will surely be true to the comics and what happened to Janet certainly feels like a mutant power. This could ultimately be a backdoor explanation for the mutant phenomenon if it ever creeps into the MCU. Hank Pym, in an accidental way, could ultimately be responsible for explaining mutants and creating some of them. He didn't end up with powers, that we know of, as a result of his time in the Quantum Realm. But what of Paul Rudd's Scott Lang? He's stuck in there now and could be for a while, given what happened in the post-credit scene. Could he obtain some powers? This is just a theory and it wouldn't necessarily mean that the potential future X-Men franchise within the MCU would spring from Ant-Man and the Wasp. It just could serve as an entry point for introducing the concept. For now, Disney is waiting on several stages of approval for their purchase of Fox and we know that the X-Men won't show up in the MCU for quite some time. However, as first put forth by Nerdist, it looks like the early mutant seeds may well have already been planted.